The digital high turndown burner ("DHTD") technology that was developed at Mestex in Dallas has been granted Canadian Patent Number 2,709,802. 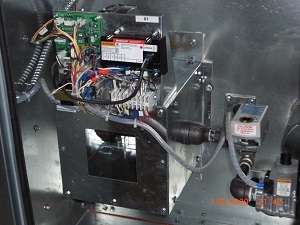 The DHTD burner technology is used on the IFL, FAP, and IFX Applied Air products. DHTD technology combines the Mestex DDC control technology with variable flow gas valve and combustion air blower to achieve turndown ratios as high as 100:1, with worst case turndown ratios of 33:1. In testing with the Mestex 2-pass heat exchanger operating efficiencies typically land in the condensing range. This technology has seen thousands of hours of successful operation on projects around North America. A United States patent has also been applied for and could be granted by the end of 2013.